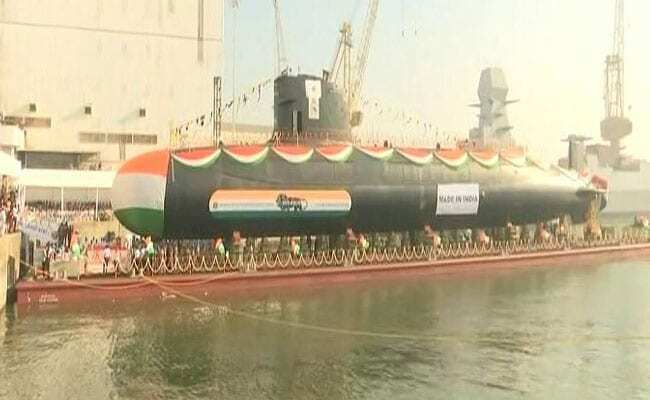 Mumbai: Marking a generational shift in submarine operations, the Indian Navy launched the third Scorpene class submarine, Karanj, at the Mazagaon dock in Mumbai on Wednesday. Navy Chief Admrial Sunil Lanba was the chief guest in the event at Mazagon Dock. The state-of-the-art Scorpene submarine has superior stealth features and the ability to launch crippling attacks with precision. Advanced acoustic silencing techniques, low radiated noise levels and hydro-dynamically optimised shape are some of the features that make it virtually invincible, unmatched by most submarines. Scorpene submarines can undertake a wide range of missions such as anti-surface and anti-submarine warfare, intelligence gathering, mine-laying and area surveillance. The submarine is designed to operate in all theatres, with means provided to ensure interoperability with other components of a Naval Task Force. At a time when the Indian Navy is facing challenges of an aging submarine fleet and strong presence of Chinese navy in the Indian Ocean, the Scorpene submarines are a huge boost to the Navy's combat system. In October 2005, the Scorpene deal was signed for India and the first submarine was due to be delivered by 2012.